The excerpts are from In the Words of Women Chapter 1, page 33, and The Letters of Benjamin Franklin and Jane Mecom edited by Carl Van Doren (Princeton: Princeton University Press, 1950), pages 155-56. See other posts by Mecom HERE and HERE and HERE. During the eighteenth century medical schools increased in number and the education of doctors became more “scientific.” Learning about the anatomy of human beings meant studying and dissecting human bodies, consequently the demand for cadavers grew. In Britain those who had been condemned to death and executed were legally subject to dissection. Soon however, the shortage of bodies led to grave robbing, and body snatching became a lucrative business; its practitioners were called “resurrectionists.” The famous pair, William Burke and William Hare, went a step farther, murdering people to supply fresh corpses to doctors and students. Body snatching also began to flourish in the United States to supply recently established medical schools, especially in cities like Philadelphia, Baltimore, and New York. Public graveyards and potter’s fields were robbed: those disinterred included the poor, African Americans and Indians. Trafficking in dead bodies disturbed many; efforts were made to protect the graves of the dead and to enact legislation governing the acquisition of cadavers. Public outrage and resentment often led to mob actions. At City Hospital in New York, on April 13, 1788, a group of boys playing near the dissection room window claimed to have recognized one of the cadavers. An angry crowd attacked the hospital but was somewhat mollified when the police rounded up the medical students and doctors and put them in jail for their safety. When the mob reassembled and threatened to storm the jail, the militia was called out, but only a few responded. The authorities fired on the crowd and three rioters were killed. Several prominent citizens joined the militia in this action, among them Governor George Clinton, Baron von Steuben, and John Jay. Serving as minister for foreign affairs for the new nation, Jay was living in New York City. His wife Sarah wrote of the incident to her mother. On Monday, the evening preceeding the day on which we expected a large company to dine, just as we were going to tea, Genl. Clarkson call’d in to know if we could lend him a sword, for says he the rioters are proceeding to the Jail & are determined to open the doors & liberate the prisoners as well as to tear in pieces the Doctors who are confin’d there, & if they effect their plan confusion, murder &c. may be the result. Mr. Jay ran up the stairs & handing Clarkson one sword, to my great concern arm’d himself with another, & went towards the Jail which the Citizens determin’d to defend. Just as he was going up the steps of the jail, a stone thrown by one of the Mob (for it was too dark to discern which) took him in the forehead & stunn’d him so that he fell. Clarkson & Rutherford who were near, carried him into the Poor-house & fetch’d [Doctor] Charlton & then brought them both home together in the Carriage. The stone must have been large as it had made two large holes in his forehead. Judge Mama of my feelings when I saw him hurried from the Carriage to the Chamber by the Dr. & other gentlemen. Sarah’s letter can be found on page 180-81 of Selected Letters of John Jay and Sarah Livingston Jay. 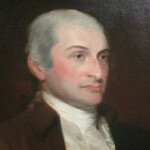 The portrait of John Jay (in thumbnail) is by Gilbert Stuart c. 1784. Anne Hulton, late in 1767, accompanied her brother Henry and his family from England to Boston where he had been named Commissioner of Customs by King George III. Almost from the very moment they set foot on American soil, their lives were in danger. Anne wrote to a friend in England in June of 1768. You will be surprized to hear how we were obliged … to take Refuge on board the Romney Man of War lying in Boston Harbour. Mrs. Burch at whose house I was, had frequently been alarmed with the Sons of Liberty surroundg her house with the most hideous howlings as the Indians, when they attack an Enemy. … These Sons of Voilence after attacking Houses, breakg Windows, beating, Stoning & bruizing several Gentlemen belonging to the Customs, the Collector mortally, & burning his boat. They consultd what was to be done next, & it was agreed to retire for the night. 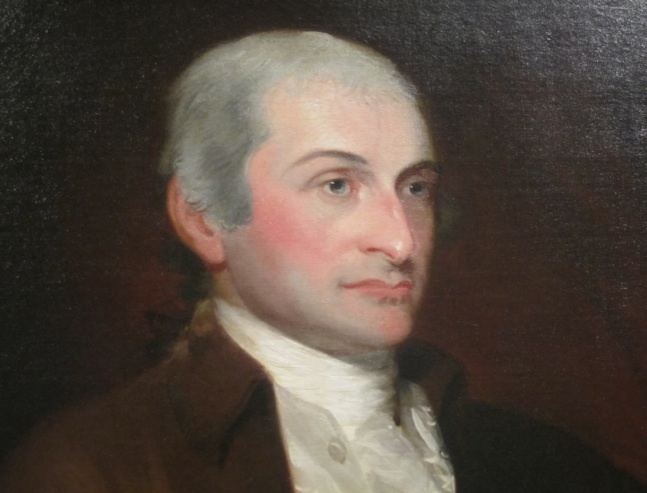 All was ended with a Speech from one of the Leaders, concludg thus, “We will defend our Liberties & property, by the Strength of our Arm & the help of our God, to your Tents O Israel.” This is a specimen of the Sons of Liberty, of whom no doubt you have heard, & will hear more. The HMS Romney Man of War was a fifty-gun British frigate stationed in Boston harbor at this time. It was responsible for seizing John Hancock’s ship Liberty as it tried to avoid paying customs duties imposed by the British. 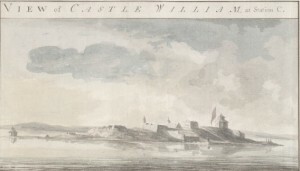 The base of British operations in the siege of Boston was Castle William in the harbor. Loyalists repaired there as well as to the Romney when they felt threatened by the Patriots. This excerpt is from In the Words of Women, Chapter 1, pages 10-11. 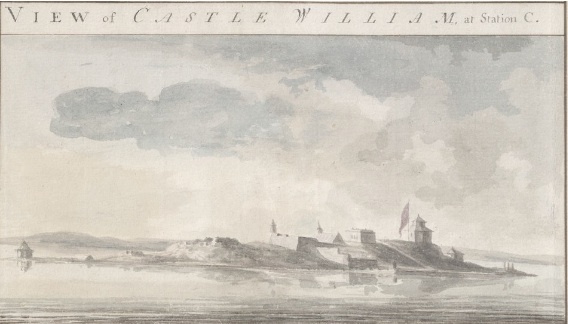 The image is by Surveyor Pierie William, 1773, and is in the British Library. Read another post by Anne Hulton HERE. Anna Rawle, the twenty-four-year-old daughter of Quaker Loyalists, recounted in a diary for her mother what happened in Philadelphia when the surrender of General Cornwallis at Yorktown (19 October 1781) became known. She and her sister Margaret were living at the time with their grandmother on Arch Street, between Front and Second Streets. The excerpts are from In the Words of Women, page 155, and from The Pennsylvania Magazine of History and Biography, published by the Historical Society of Pennsylvania, Volume 16, 1892, “A Loyalist’s Account of Certain Occurrences in Philadelphia after Cornwallis’s Surrender at Yorktown,” pages 104-107. The image is from The Freeman’s Journal: or The North-American Intelligencer, Philadelphia, 31 October 1781,included in the National Humanities Center Resources Toolbox, Making the Revolution: America, 1763-1791. Christian Barnes, the wife of a colonial businessman, wrote to a friend in Scotland in 1769 of escalating unrest in the Boston area. The greatest loss we have as yet met with was by a mob in Boston, who, a few Nights ago, atacked a wagon Load of goods which belong’d to us. They abused the Driver, and cut a Bag of Pepper, which contain’d three hundred pd, leting it all into the street; then gather’d it up in their Hand[kerchie]fs & Hatts, and carried it off. This excerpt is from In the Words of Women, Chapter 1, pages 14-15.